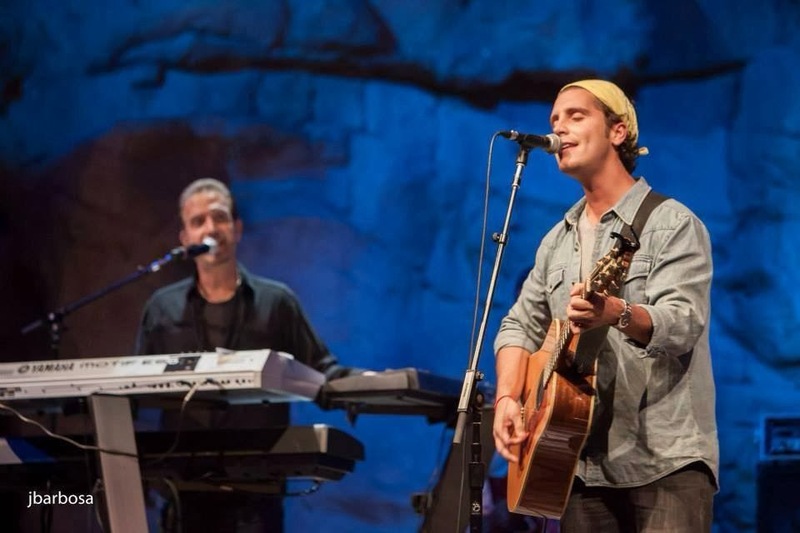 Nick Fradiani is a great singer, songwriter, guitarist and bassist. He started playing the guitar at the age of 8. He won the East Haven Exchange Club Talent Show with his band at the age of 13. He graduated from the University of New Heaven. In the mid 70s Nick became member of the groups called Sagebrush Rock Band and Gene Cipriano Band. In 1977 Nick Fradiani formed his own show band called "Rhapsody". From 1977 to 1984 the group appeared in various hotels and casinos across the country. At the beginning the members of the group were Nick Fradiani on bass, guitar and lead vocals, Jon Turner on guitar and sax, Joe Mirando and Carolyn Grant on lead vocals. Later Carolyn Grant was replaced by the singer Debbie Horner. Joe Mirando left from the group and was replaced by Allen Adams. The band got together about two years ago after Fradiani, Turner and the drummer Allen Adams finished an extended period playing on the road. Debbie Horner also left from band. Later Nick Fradiani recruited the keyboard player Paul McCoy. Allen Adams contacted with the singer Asa Harris with whom he had played years earlier in Hawkins Road another New Heaven area band of the mid 70's. The group with Asa Harris acquired a different dimension. Asa Harris daughter of singer, pianist, arranger for the original InkSpots Ace Harris and the niece of world famous trumpet player and big band leader Erskine Hawkins gave with her voice a jazzy feeling in the band. While the group was appearing in various hotels, casinos and clubs, they entered in the studio and recorded an album. The album was recorded at Connecticut Recording Studios, Bridgeport, CT. In my opinion, it is one of the top albums that were ever recorded. The songs of the album have two directions, those that Nick Fradiani sings and the ones that Asa Harris sings. The first direction has a pop/soul feeling and the second direction has a soul/jazz feeling. It is worthy to note that the heart of the band is Jon Turner. Jon played soprano, alto and tenor saxophones as well as flute and lead electric guitar. He was also on backing vocals. The other members Allen Adams on drums, percussion and background vocals. He also sang the song "On And On". The compositions on both directions are brilliant, excellent. Nick Fradiani wrote three songs entitled "Sunset Beach", "Lady Of Song" and "Empty Promises". All these songs performed by himself. The other songs performed by Asa Harris were written by Jon Turner (You never know) and by Paul McCoy and Flo Goldstein (Touch me (All ya gotta do is)) The song "Broadway Medley" is a medley of songs "New York,New York", "One", "What I did for love" and "Tomorrow". All the songs were produced by Rhapsody. Sax and flute arrangements by Jon Turner. String arrangements by Paul McCoy. The band except for the album released a single entitled "Sunset Beach / You never know" in the same year on the same label. In 1982 they continued to perform in various places like the Sheraton in Station Square. Their appearance was great. Asa Harris was outstanding. Her style had some of Dionne Warwick and Ethel Merman. She finished with her hour-long show with a 10-minute medley of Dionne Warwick's songs. Her singing partner and band leader, Nick Fradiani was excellent on the stage. He performed a medley of songs by Kool & The Gang and Neil Diamond. He also performed songs from the big band period. However the highlight of this night was a fantastic duet of Nick Fradiani and Asa Harris, when they performed the famous song "Endless Love". When the band disbanded in 1984, Nick Frediani followed a solo career. A year later Nick returned to Connecticut and started working on his new release. The single entitled "Midnight Lady / Hold On To Our Love" was released as a 12-inch on the Sunset Beach Records. Both songs were produced by Vic Steffens. 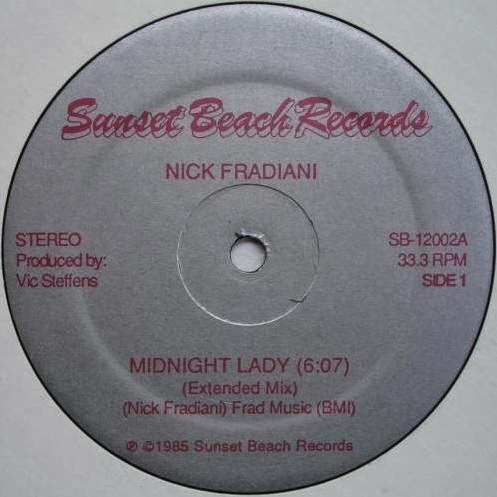 "Midnight Lady" is a catchy upbeat dance record written by Nick Fradiani. It features him on all vocal parts backed by a richly textured horn section and a dynamic guitar solo performed by Rohn Lawrence. This 12-inch single contains two versions of Midnight Lady. 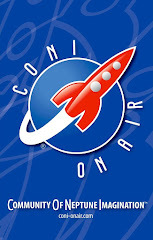 A long version dance mix and a short mix for radio play. "Hold On To Our Love" is written by Nick. Featuring him on vocals along with the beautiful saxophone work of Jon Turner. After "Midnight Lady", he began to perform as a piano player and keyboardist, playing in cruise ships (Cunard Line) and major hotels. He landed back in Atlantic City at Resorts International, and began performing internationally with stints in Montreal, Costa Rica, Jamaica, Acapulco and Aruba. By the early nineties, Nick was back in the studio recording his first solo album “Living on the Edge of Time". In 2009, Nick is releasing a brand new CD titled “Aruba Nights” which was recorded at Horizon Recording Studio and was produced by Vic Steffens (also producer of "Midnight Lady" and "Living on the Edge of Time"). Nowadays, Nick Fradiani along with the previous member of Rhapsody Debbie Horner appear in various places as The Rhapsody Band. His passion for music has been passed down to his son Nick Fradiani Jr., who has also been performing as a singer, songwriter and guitarist. They have teamed up in the studio on the Aruba Nights CD for the duet “In Her Loving Soul”. Nick Fradiani Jr. has formed his own band named Beach Avenue. The Band was formed in the Summer of 2011. Nick Fradiani Sr is also member as a keyboardist. Finally, I want to mention some things for Asa Harris. The daughter of pianist Ace Harris and the niece of the legendary Erskine Hawkins, Asa Harris grew up surrounded by music. She started in the early 70s. She sang in choirs and plays in Catholic grade school and, as a speech and drama major at Catholic University. In 1975 she sang with entertainer/ompressionist/comedian Billy Fellows. Later she joined in the Rhapsody Band until 1984. After Rhapsody Band she appeared in various clubs and hotels and she collaborated with the singer Tony Viviano. Harris worked as an actress in theater for many years. She has appeared in the 1996 film 'A Family Thing,' starring Robert Duvall. Harris often sang with her Uncle Erskine's band in the NY Catskills, taught jazz vocal performance at Webster University, and was active in bringing jazz into the elementary and junior high schools in and around St. Louis, MO. In 1999 Asa Harris made her long overdue recording debut, interpreting standards (including Erskine Hawkins' acclaimed theme song "Tuxedo Junction) on her 'All In Good Time' CD. Since moving to Seattle in 2005, Asa (aka Chaplain Maggie Finley) has devoted her time to serving as a home hospice chaplain. # You can find here a digital download for the song "Midnight Lady" . ## To make this article, I worked for over a year.